Analysis? What, where, how, who, huh? When a requirement arises, we take time to analyse all aspects of what would be required so that we can ensure the correct solution is put in place for your company. In some cases it could be a combination of solutions. We take the time to understand your business processes and work with you in ensuring the right solution for you. "If a tree falls in a wood and there is nobody around to see it, does it still make a sound?" The same applies to your business. In order for you to be seen online, you need a website! 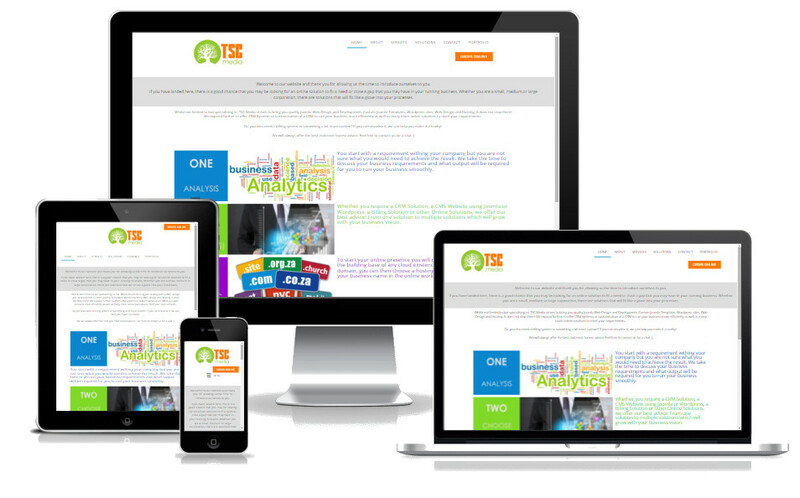 We can assist you from a One Pager to a complex CMS (Content Management System). Simply contact us or order online and we will be in touch with you. Once your online solution is in place, we offer a Maintenance Service Level Agreement on a month to month basis. You can choose you desired monthly hours. The SLA inception will carry a required commitment of 3 months. ...and other system requests which are all logged and reported on. The benefit of an SLA is that hourly rates are reduced by 50%. Hours over and above the SLA are also reduced by 25%. Non SLA hourly rate: R 400/hour. Custom Package options also available. Prepaid SLA hours are also availalbe at R 300/hour and are usable within one year of purchase. To start your online presence you will require a domain. A domain is the building base of any cloud existence. These TLD's range from your basic .co.za extension to the latest city extensions (.joburg, .capetown, .durban). Once you have a chosen domain, you can then choose a hosting solution which will kick start your business name in the online world. Once you are hosted, we can add your website, emails and/or developed online solution. We also offer discounts for 6 and 12 months pre-payments. You are welcome to order online or contact us for assistance.